If you love comfort and are looking for a holiday home with a private pool, then keep on reading! This stunning holiday home lies in the vicinity of Svetvinčenat and about 15 km away from Fažana with its beaches. There's a swimming pool, large terraces that can be covered, garden furniture, barbecue, and there are no fewer than four parking spaces. Your holiday home has two floors that are connected by an outdoor staircase, and that are decorated identically. Indoors, you can enjoy the tranquility provided by the bright interior combined with the tile floor. It's modernly decorated and it is the ideal place for a perfect and carefree holiday. There are fully equipped kitchens, so you can make lovely meals for all the guests. You can also relax on the couch or enjoy a bite or a drink on one of the many terraces outside. 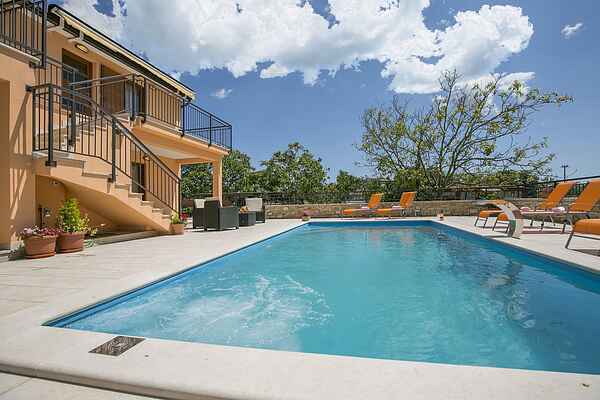 Additionally, you can take a refreshing dive in the private pool. The town Fazana with its restaurants and shops lies about 15 km away. From Fazana you can take a ferry to the National Park Brioni, which is certainly recommended.